Can I dispense solder paste on a rotated board? I have tried a few prints with the voltera and it works very well, but a bit limited until we get the doublesided functionality in place. However I think the machine pays itself in regards of solderpaste dispensing. Just assembled a few dense pcb cards that just came in the mail, where we don't have bothered with a stencil (since there is guaranteed to be changes). After a few adjustments it dispensed solderpaste perfectly on all the cards. Great stuff! 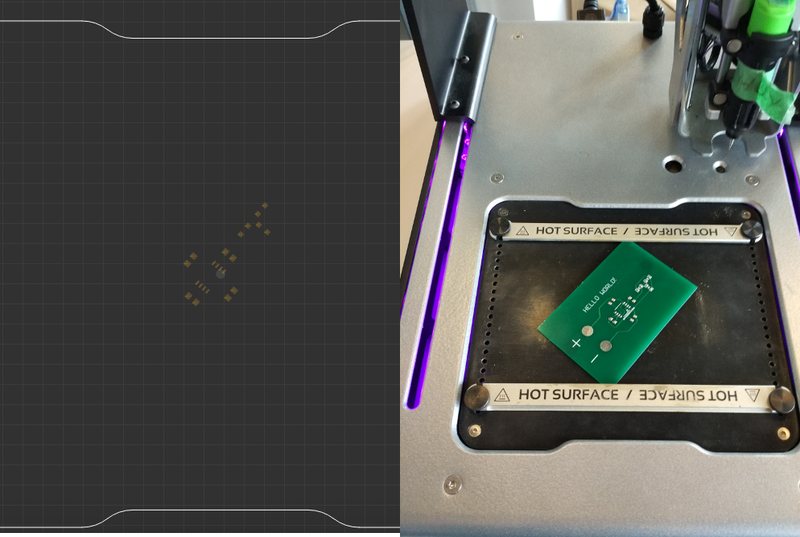 I think this might be my prefered method for solder paste dispensing on small batches as well, since it's mutch more convenient to be able to do one card at a time, compared to stencil frame with lots of cards that needs to be p&p within a time frame. Only problem was clamping the cards, since it has connector on the edges and no obvious way to rotate the card placement in software? Template for dispensing settings. I had to use advanced settings and change the Z and E values, no way to save/recall this easy, so I have to write it down somewhere and remember to change it before starting a job. Possibility to rotate the card in SW.
Also, while baking my print the software locks up (counter stoping, no response). But I just close the program and wait until the machine changes status color. If you have connectors going all the way to the edges (or a very large board) it will certainly be awkward to secure the board . We've encountered the same issue a few times ourselves and our go to solution is to use some Kapton (Polyimide) tape to secure the board down. We prefer Kapton since it will not leave adhesive residue (unlike electrical tape) and it is high temperature. This means that you can leave the tape on during the reflow cycle and the tape will come off clean afterwards. If you adjusted the height (Z) during a print, the software will remember it for you for your next print, even if you restart it. Out of curiosity - what height (Z) value did you end up choosing? The default for paste is 0.14 mm. The E value is a relative value, clicking + or - simple rotates the gear and will push or pull the plunger inside the dispenser by a tiny amount. It doesn't really make sense to 'save' that value. It's a value that might have to be tweaked every time you print. With that said, if you are careful with the dispenser and you do not move the gear by hand after it has been calibrated, you should not have adjust E the next time you print. If you have some cool boards that you've dispensed on, and you are comfortable sharing them, feel free to post them here or in the #madeWithVoltera post. Sorry for the late reply. Have been busy and on a 3 week vacation. But now it's back to reality. Clamping board: Yeah it's not a huge deal, I usually find a way. It helped that I figured out that the board can in fact be oriented any way But this was not very obvious in the UI. Thanks for explaing the E settings. For my 2 layer cards from EuroCircuits I have found Z of 0.35mm to work very well.